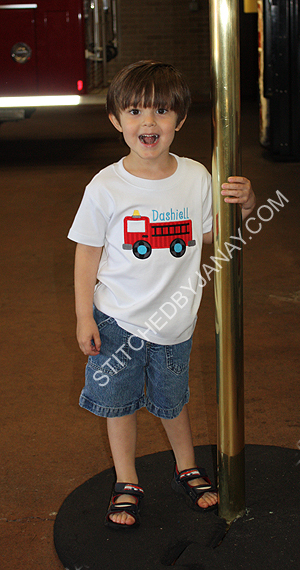 Trip to the Fire Station! 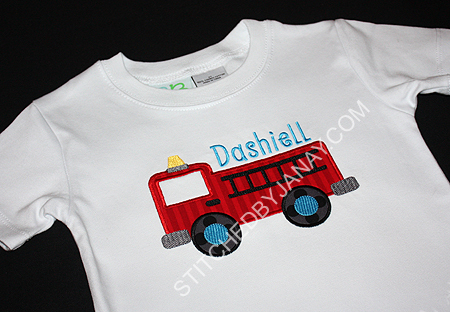 This actually is the first fire truck design I've used. I've never had a request or need, but I've always been on the lookout for a good SIMPLE one to have on standby. When I saw this design I thought, "This is it!" Isn't it cute? 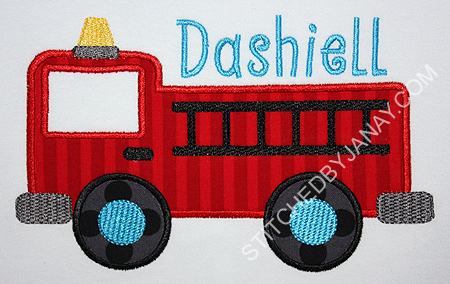 The Fire Truck design is from Happytown Embroidery. I've had the pleasure of getting to know Lori through forums and groups. 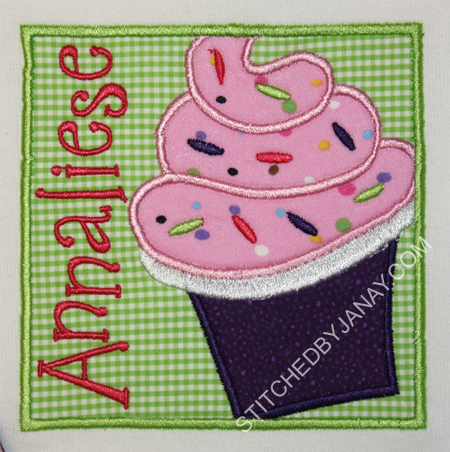 She does beautiful applique work and has recently started selling her own designs! There are lots in her shop that I'm admiring, check it out! 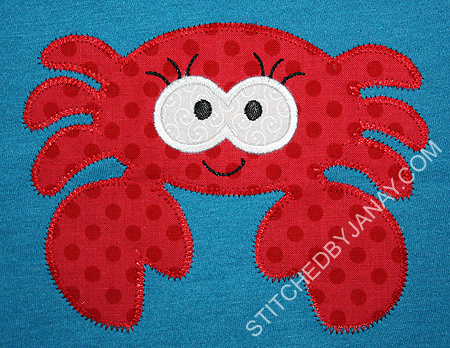 I really liked the fill stitch pattern used in the bumpers and tires, it adds extra texture. I added Dashiell's name with 8CP's Burst. Nice font with tall/thin letters so I could fit an 8-letter name in that space. :) I debated for a while what color to use for his name. I really like aqua and red together, so I picked that. 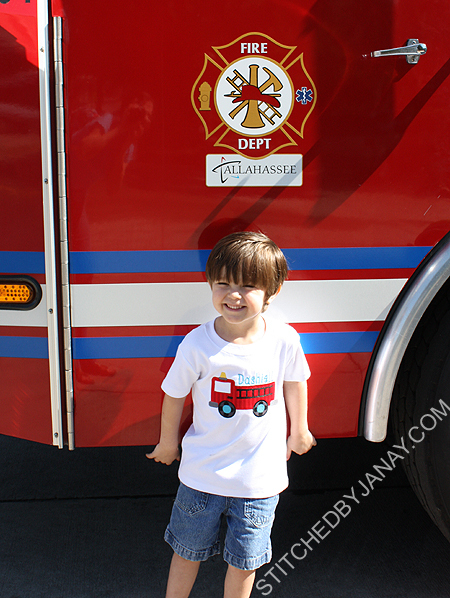 And look what accent color is on our firetrucks in town! 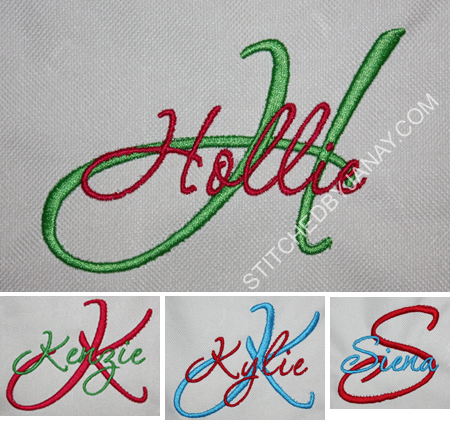 I added my monogram with 8CP's Monogram Three. My close-up of it didn't turn out well. You know me and red... I'll try again another time. It's pretty though! Nathan is celebrating his birthday Toy Story style. 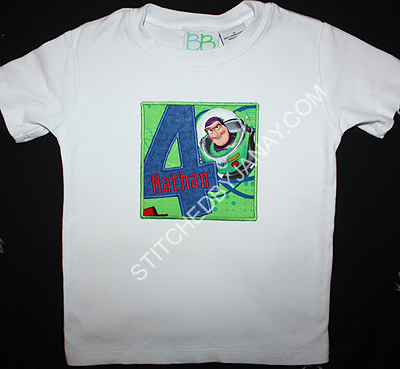 When his mommy showed him a couple options (like Maddox's Space Explorer shirt, or Jimmie and Jackson's birthday shirts) he picked the number four design! 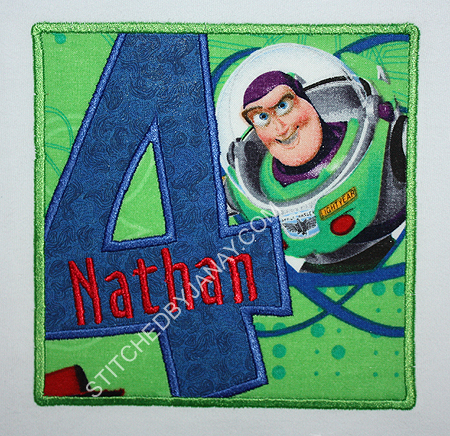 The Box Font numbers are from Itch 2 Stitch. I added his name with 8CP's Tiny. We found the fabric at Hobby Lobby. 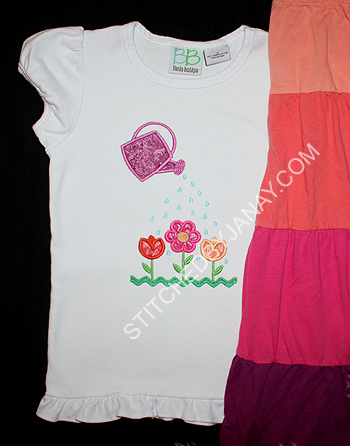 When I saw this Watering Can with Flower Garden design for Lynnie Pinnie, I remembered Annaliese's four layer skirt that didn't have a matching shirt. (Gasp!) 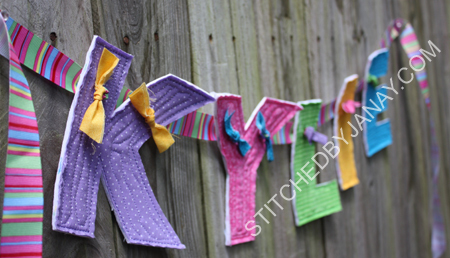 We spent time on a Sat afternoon looking through my fabric stash (these are odd colors!) and found four 5" charms from my Fairy Frost set that worked great! 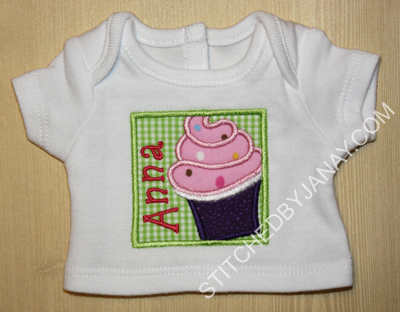 but also the 4x4 size for Anna! 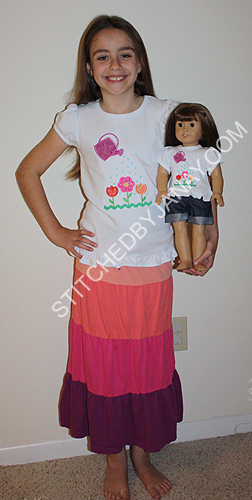 YES, a full 4" long design fit on the doll shirt! No resizing required! 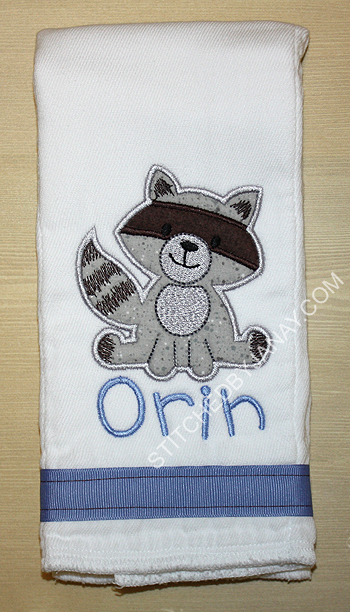 I knew right away I'd use Lynnie Pinnie's raccoon design! I added his name with 8CP's Bobby. 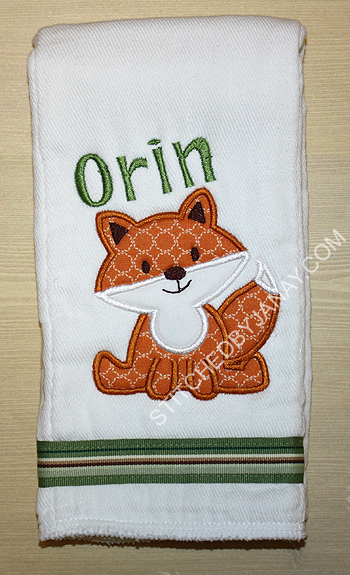 I also had a cute fox design on my wishlist so I used this project as an opportunity to buy it. :) The Fox Applique is from A Creative Medley, and I added his name with 8CP's Woof. 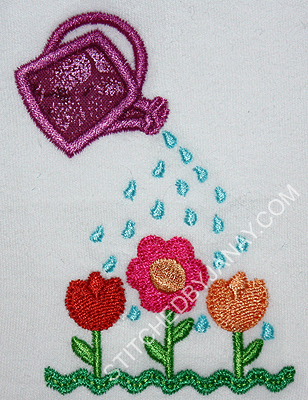 Both components of this design are from Embroidery Boutique. I used EB's Dotty Alphabet for the O and merged the owl from the Owl Branch design on top. 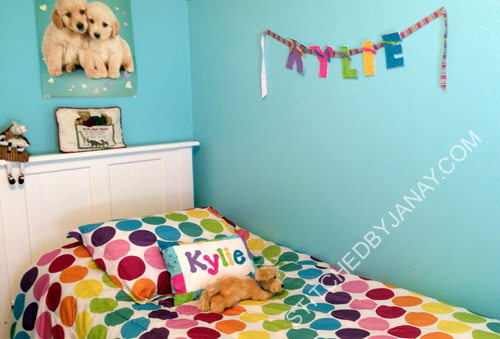 Kylie's big gift this year is a bedroom makeover. It's so pretty completed with aqua walls, new bedding, and her pillow/banner in place! I used the Corinthia Script from Katelyn's Kreative Stitches. I had purchased it when it was briefly available back in 2010, but now it's back with additional sizes! When I redownloaded the files I felt like my investment had doubled in value! 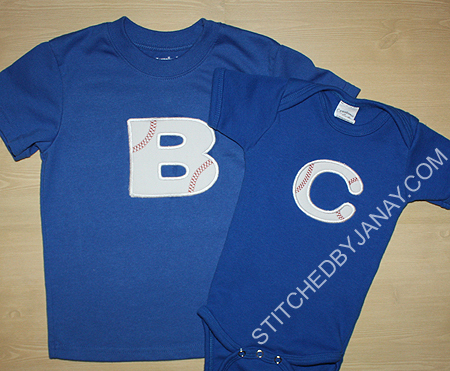 I used the 3" size for the initial and 1.5" size for the names. 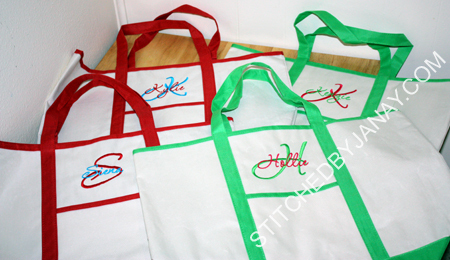 I used hot pink on the lime totes, and aqua on the red totes. I'm looking forward to using this font more! 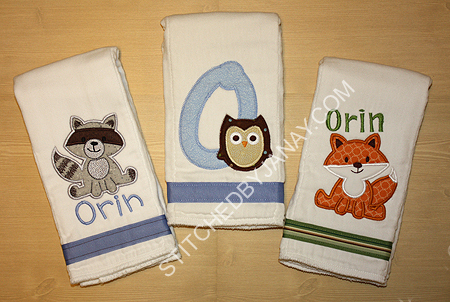 In-The-Hoop Bib and Burp Cloth! 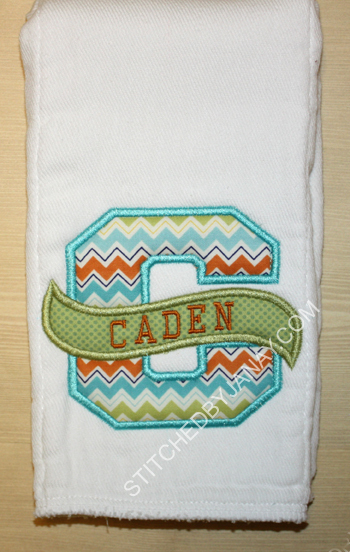 Earlier in the week I shared a big gift set I made for Caden, but none of those items were from *me*. After two onesies (plus a gift certificate for another), two shirts for big brother, three burp cloths and a bib, I was running out of ideas for my shower gift. Then in walked Carolynn of Zippy DesignZ to save the day! 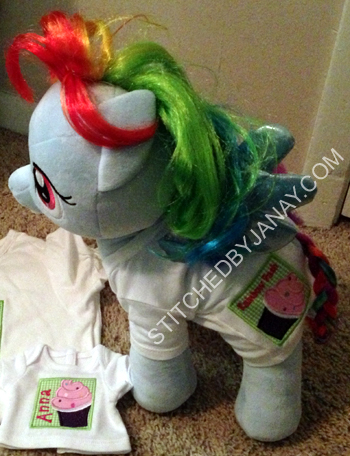 Have you seen her new Peeker Bibs and Peeker Burp Cloths? Go take a peek, they are cute! Now, because I was very short on time and this was my first attempt, I took the easy route... I actually didn't stitch the peeker, just the Rik Rak, and added Caden's name with 8CP's Nicole. 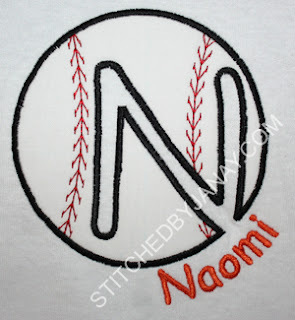 I used cotton on the front (love that sports ball fabric) and a hand towel on the back. I like how they turned out. It challenged me to finally open my SnapSetter, wow using that was easy peasy, I'm not sure why I hadn't tried it before! 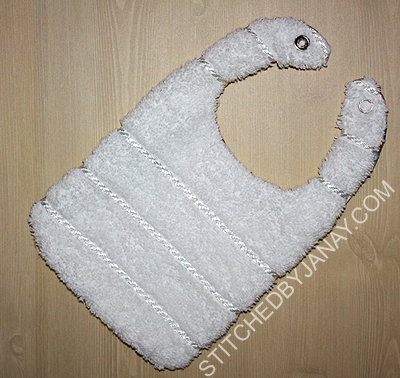 Well this "quick" project did not turn out like I originally envisioned, but I think it's even better! But for whatever reason (fast sloppy hooping?!) my shirt did not stay flat and I got this really poufy center. ACK! 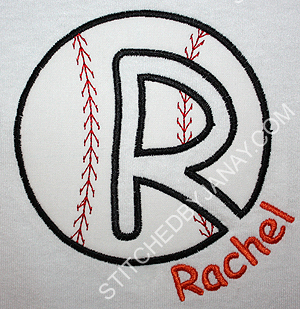 I stopped there, I knew if I stitched the letter on top it would be permanently wrinkled and look terrible. I had to get rid of that excess knit... 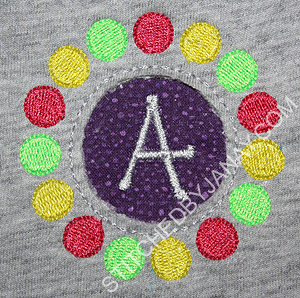 Reverse applique to the rescue! 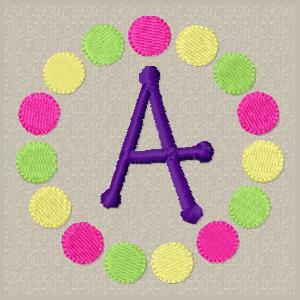 I went back to my computer and digitized a small triple bean stitch circle to place inside the dot frame, and changed the size of the A slightly. 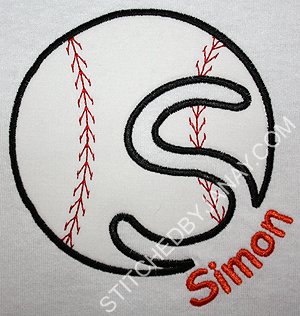 Then I laid the shirt back on top of my hoop, pinning in place, and stitched the triple bean stitch circle. I cut away the poofy knit, revealing smooth monogrammed fabric! 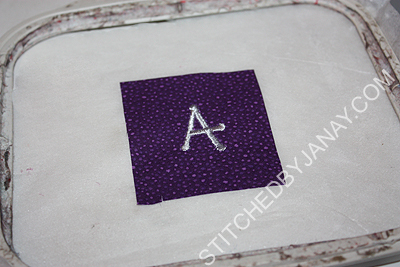 I'm thankful that a year ago I read Tasha's blog post about using reverse applique to redeem a project. It came in handy for me on this! 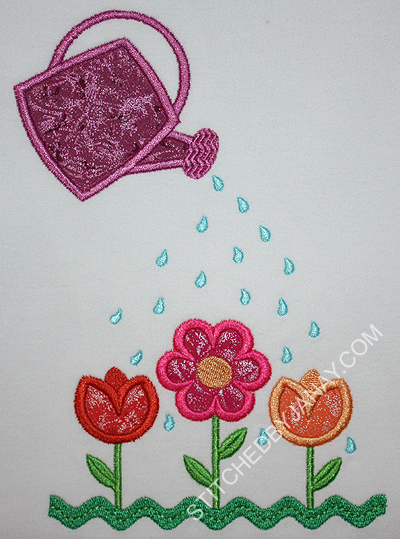 Go check it out: New Project: Reverse Applique at The Plaid Pineapple. Today my girl is NINE! I can't believe it! 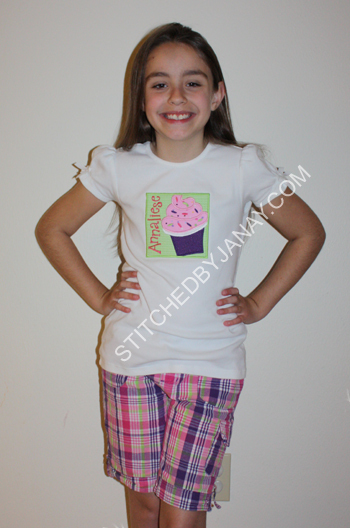 This year we selected Itch2Stitch's Cupcake Box design for her birthday shirt, primarily because it came with a 2.5" version just perfect for an American Girl doll shirt. Color palette was picked to match these shorts. We contemplated putting a 9 in the cupcake wrapper, but Annaliese decided to go with something more subtle, so we added nine sprinkles to the cupcake. I used Quirky from I2S to add their names. 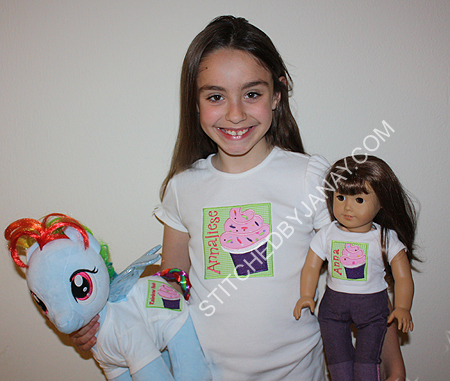 I have two more of those shirts so you might see some more in the future! 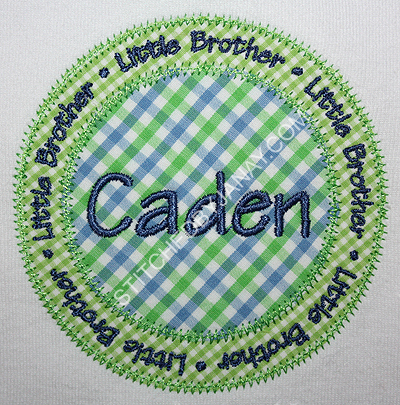 The big brother and little brother patches are both from Applique Momma. I added their name with Jolson's Architect. 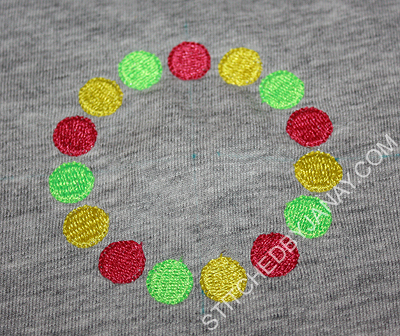 I think I have finally figured out a fabric/thread/font combo that I LOVE with this design. Yay! 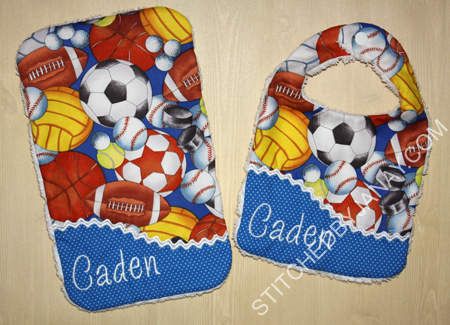 And a couple burp cloths. I was told to do whatever I wanted, so I used it as an opportunity to finally use some cute designs that have been sitting in my stash! 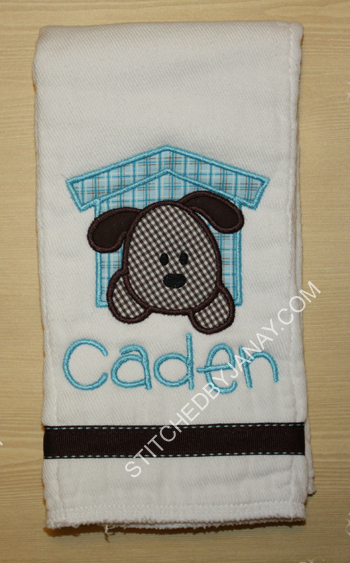 The Puppy Patch is from Applique Cafe -- isn't this precious?! I added his name with 8CP's Bobby. 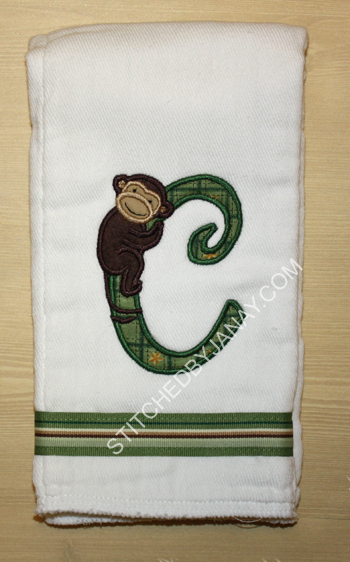 And MCA's Jungle Jungle Applique Alphabet. Looking forward to using this again in larger sizes! Well, it's that time of year again... 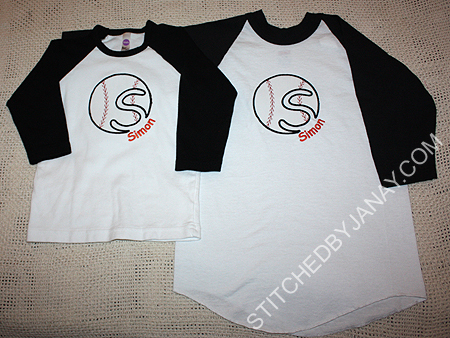 Baseball season has begun, and these kids needed new shirts to celebrate! 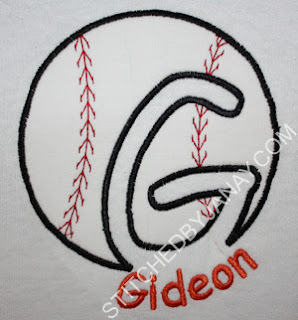 I've made opening day shirts for them several times (2008, 2009, 2010, 2012), and this year their mommies selected East Coast Applique's Baseball alphabet. I added their names with Embird Alphabet #4. 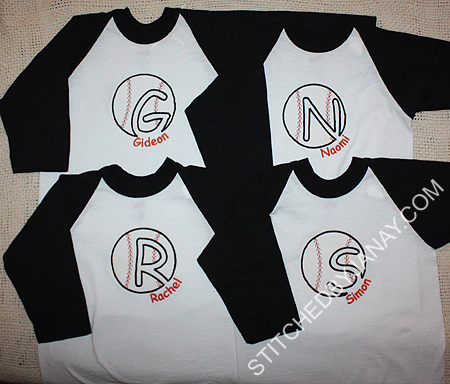 This year we finally managed to get their baseball designs on raglan tees! We've tried in the past, but I struggled finding a brand that had all the right sizes. The older three are now big enough to wear the XS Soffe brand that I got at Sports Authority. But I was afraid it was going to be a dress on Simon, so we ordered a toddler size six from American Apparel. But when it was in my hands, I was afraid it would be too small! Since he's currently in Bangkok... I couldn't exactly try it on him first. :) So for good measure I made two, knowing eventually he would grow into the other! 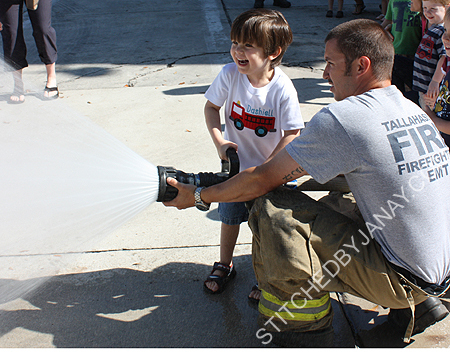 Check out this enormous size difference between a toddler size 6 and a youth 6/7. ACK!